A Facelift or a Minimal Downtime Facelift: Which is Right for You? The Boca Raton region of Florida sees average highs ranging from the mid-70s to the low-90s throughout the year. With those warm temperatures comes plenty of sun. In fact, USA Today reports that coastal areas like Miami experience sunny days approximately 70 percent of the time. Being closer to the equator, those sunny days also lead to more exposure to UVA and UVB rays. Unless you are extremely cautious about avoiding time in the sun, even when you're driving in your car, it's likely your skin has experienced sun damage and is aging as a result. If you're tired of the wrinkles, lines, and sagging skin, a trip to a Florida facial plastic surgeon, such as Dr. Nathan Nachlas in Boca Raton, is essential. A facelift is a long-lasting surgical procedure that can help fight the lines, wrinkles, sags, and bags that occur as you age. There are two options when it comes to a facelift. You can choose the traditional facelift or the minimal downtime face lift. The traditional facelift takes approximately two to four hours for Dr. Nachlas to complete. It's best for men and women who are already seeing more severe signs of sagging and wrinkling. During this surgery, incisions are made in the temples within the hair, following the natural folds of the ears, and then back behind the ears and into the hairline. This ensures that scars are incredibly hard to see. After the incisions are made, the skin is lifted so that the underlying tissue and muscle can be adjusted to create a more youthful frame. The skin is draped over this new frame, excess skin is removed, and the incisions are closed. This entire process reduces sagging skin on the lower face and smoothes some lines and wrinkles in the process. Following a traditional facelift, you spend some time in a recovery room while the effects of the general anesthesia wear off. When Dr. Nachlas feels you're ready to return home, your driver takes you home where you begin your recover. Any discomfort is managed with pain medications recommended by Dr. Nachlas. You will wear bandages around your face, and bruising and some swelling is to be expected. After a healing process spanning about 14 days, you'll be ready to return to your job and social activities. The lifespan of a facelift varies from patient to patient, but some find the benefits can last up to 10 years. The minimal downtime face lift offers the same benefits as a traditional facelift, but it is better for patients who are just starting to experience sagging and wrinkling in their lower face. During this procedure, the incisions are smaller and start in front of your ear and traveling behind the ear. Tissue and muscle are tightened and excess skin is removed. This surgery only takes 60 to 90 minutes. Following a minimal downtime face lift, you go home to recover. There will be some swelling and a little discomfort, but by the end of a week, you should be ready to return to work or regular social activities. Visit the facial cosmetic surgery photo gallery to view the differences between patients who undergo traditional facelifts and those who undergo minimal downtime facelifts. For more information or to request a consult with Dr. Nachlas contact Sandy Friedman, Director of Patient Relations at 561-939-0909. 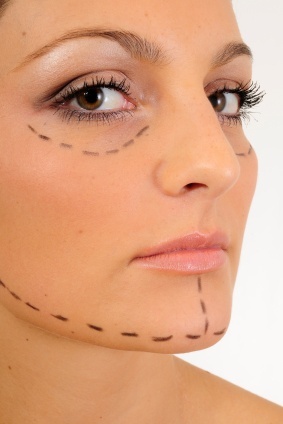 Facial Cosmetic Surgery: Where Do I Start? Minimal-Downtime Facelift: Is It Right for Me?